The Adult Eggplant Costume is the best way to get your veggies this Halloween. This funny and unique vegetable costume makes a great addition to a fruits and veggies group costume. Anyone familiar with emojis will also know eggplants other meaning! Includes a soft costume jumpsuit. One size fits most. 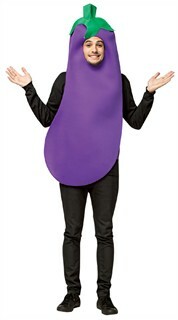 Availability: The Adult Eggplant Costume takes approximately 1 business day to leave the warehouse.